"Merkel" redirects here. For other uses, see Merkel (disambiguation). Angela Dorothea Merkel (/ˈmɜːrkəl, ˈmɛərkəl/, German: [aŋˈɡeːla ˈmɛɐ̯kl̩];[a] née Kasner; born 17 July 1954) is a German politician serving as Chancellor of Germany since 2005. She served as the leader of the centre-right Christian Democratic Union (CDU) from 2000 to 2018. Merkel has been widely described as the de facto leader of the European Union, the most powerful woman in the world, and by many commentators as the leader of the Free World. Merkel was born in Hamburg in then-West Germany and moved to East Germany as an infant when her father, a Lutheran clergyman, received a pastorate in Perleberg. She obtained a doctorate in quantum chemistry in 1986 and worked as a research scientist until 1989. Merkel entered politics in the wake of the Revolutions of 1989, and briefly served as a deputy spokesperson for the first democratically elected East German Government headed by Lothar de Maizière in 1990. Following German reunification in 1990, Merkel was elected to the Bundestag for the state of Mecklenburg-Vorpommern, and has been reelected ever since. As the protégée of Chancellor Helmut Kohl, Merkel was appointed as the Federal Minister for Women and Youth in Kohl's government in 1991, and became the Federal Minister for the Environment, Nature Conservation and Nuclear Safety in 1994. After her party lost the federal election in 1998, Merkel was elected Secretary-General of the CDU before becoming the party's first female leader two years later in the aftermath of a donations scandal that toppled Wolfgang Schäuble. Following the 2005 federal election, Merkel was appointed Germany's first female chancellor at the head of a grand coalition consisting of the CDU, its Bavarian sister party the Christian Social Union (CSU), and the Social Democratic Party of Germany (SPD). In the 2009 federal election the CDU obtained the largest share of the vote, and Merkel was able to form a coalition government with the Free Democratic Party (FDP). At the 2013 federal election, Merkel's CDU won a landslide victory with 41.5% of the vote and formed a second grand coalition with the SPD, after the FDP lost all of its representation in the Bundestag. After the 2017 federal election the CDU was again the largest party, and she was reelected to her fourth term on 14 March 2018. In 2007, Merkel was President of the European Council and played a central role in the negotiation of the Treaty of Lisbon and the Berlin Declaration. One of Merkel's consistent priorities has been to strengthen transatlantic economic relations. Merkel played a crucial role in managing the financial crisis at the European and international level, and she has been referred to as "the decider." In domestic policy, health care reform, problems concerning future energy development and more recently her government's approach to the ongoing migrant crisis have been major issues during her Chancellorship. On 26 March 2014, Merkel became the longest-serving incumbent head of government in the European Union and she is currently the senior G7 leader. In October 2018, Merkel announced that she would not seek reelection as leader of the CDU at the party convention in December 2018 and as Chancellor in 2021. Merkel's paternal grandfather, Ludwik Marian Kaźmierczak, in Polish Blue Army uniform, and his then-fiancée Margarethe, Merkel's grandmother. Merkel was born Angela Dorothea Kasner in 1954, in Hamburg, West Germany, the daughter of Horst Kasner (1926–2011; né Kaźmierczak), a Lutheran pastor and a native of Berlin, and his wife Herlind (1928–2019; née Jentzsch), born in Danzig (now Gdańsk, Poland), a teacher of English and Latin. She has two younger siblings, Marcus Kasner, a physicist, and Irene Kasner, an occupational therapist. In her childhood and youth, Merkel was known among her peers by the nickname "Kasi", derived from her last name Kasner. Merkel is of German and Polish descent. Her paternal grandfather, Ludwik Kasner, was a German policeman of Polish ethnicity, who had taken part in Poland's struggle for independence in the early 20th century. He married Merkel's grandmother Margarethe, a German from Berlin, and relocated to her hometown where he worked in the police. In 1930, they Germanized the Polish name Kaźmierczak to Kasner. Merkel's maternal grandparents were the Danzig politician Willi Jentzsch, and Gertrud Alma née Drange, a daughter of the city clerk of Elbing (now Elbląg, Poland) Emil Drange. Since the mid 1990s, Merkel has publicly mentioned her Polish heritage on several occasions and described herself as a quarter Polish, but her Polish roots became better known as a result of a 2013 biography. Religion played a key role in the Kasner family's migration from West Germany to East Germany. Merkel's paternal grandfather was originally Catholic but the entire family converted to Lutheranism during the childhood of her father, who later studied Lutheran theology in Heidelberg and Hamburg. In 1954, when Angela was just three months old, her father received a pastorate at the church in Quitzow [de] (a quarter of Perleberg in Brandenburg), which was then in East Germany. The family moved to Templin and Merkel grew up in the countryside 90 km (56 mi) north of East Berlin. In 1968, Merkel joined the Free German Youth (FDJ), the official communist youth movement sponsored by the ruling Marxist–Leninist Socialist Unity Party of Germany. Membership was nominally voluntary, but those who did not join found it difficult to gain admission to higher education. She did not participate in the secular coming of age ceremony Jugendweihe, however, which was common in East Germany. Instead, she was confirmed. During this time, she participated in several compulsory courses on Marxism-Leninism with her grades only being regarded as "sufficient". At school, she learned to speak Russian fluently, and was awarded prizes for her proficiency in Russian and Mathematics. Merkel was educated at Karl Marx University, Leipzig, where she studied physics from 1973 to 1978. While a student, she participated in the reconstruction of the ruin of the Moritzbastei, a project students initiated to create their own club and recreation facility on campus. Such an initiative was unprecedented in the GDR of that period, and initially resisted by the University; however, with backing of the local leadership of the SED party, the project was allowed to proceed. Near the end of her studies, Merkel sought an assistant professorship at an engineering school. As a condition for getting the job, Merkel was told she would need to agree to report on her colleagues to officers of the Ministry for State Security (Stasi). Merkel declined, using the excuse that she could not keep secrets well enough to be an effective spy. Merkel worked and studied at the Central Institute for Physical Chemistry of the Academy of Sciences in Berlin-Adlershof from 1978 to 1990. At first she and her husband squatted in Mitte. After being awarded a doctorate (Dr. rer. nat.) for her thesis on quantum chemistry in 1986, she worked as a researcher and published several papers. In 1986, she was able to travel freely to West Germany to attend a congress; she also participated in a multi-week language course in Donetsk. The fall of the Berlin Wall in November 1989 served as the catalyst for Merkel's political career. Although she did not participate in the crowd celebrations the night the wall came down, one month later Merkel became involved in the growing democracy movement, joining the new party Democratic Awakening. Following the first (and only) multi-party election in East Germany, she became the deputy spokesperson of the new pre-unification caretaker government under Lothar de Maizière. Merkel had impressed de Maiziere with her adept dealing with journalists questioning the role of a party leader, Wolfgang Schnur, as an "informal co-worker" with the homeland security services. In April 1990, Democratic Awakening merged with the East German Christian Democratic Union, which in turn merged with its western counterpart after reunification. In the German federal election of 1990, the first to be held following reunification, Merkel successfully stood for election to the Bundestag in the parliamentary constituency of Stralsund – Nordvorpommern – Rügen in north Mecklenburg-Vorpommern. She has won re-election from this constituency (renamed, with slightly adjusted borders, Vorpommern-Rügen – Vorpommern-Greifswald I in 2003) at the seven federal elections held since then. Almost immediately following her entry into parliament, Merkel was appointed by Chancellor Helmut Kohl to serve as Minister for Women and Youth in the federal cabinet. In 1994, she was promoted to the position of Minister for the Environment and Nuclear Safety, which gave her greater political visibility and a platform on which to build her personal political career. As one of Kohl's protégées and his youngest Cabinet Minister, she was frequently referred to by Kohl as "mein Mädchen" ("my girl"). After the Kohl Government was defeated at the 1998 election, Merkel was appointed Secretary-General of the CDU, a key position as the party was no longer part of the federal government. [citation needed] Merkel oversaw a string of CDU election victories in six out of seven state elections in 1999, breaking the long-standing SPD-Green hold on the Bundesrat. Following a party funding scandal that compromised many leading figures of the CDU – including Kohl himself and his successor as CDU Leader, Wolfgang Schäuble – Merkel criticised her former mentor publicly and advocated a fresh start for the party without him. She was subsequently elected to replace Schäuble, becoming the first female leader of a German party on 10 April 2000. Her election surprised many observers, as her personality offered a contrast to the party she had been elected to lead; Merkel is a centrist Protestant originating from predominantly Protestant northern Germany, while the CDU is a male-dominated, socially conservative party with strongholds in western and southern Germany, and its Bavarian sister party, the CSU, has deep Catholic roots. Following Merkel's election as CDU Leader, the CDU was not able to win in subsequent state elections. As early as February 2001 her rival Friedrich Merz had made clear he intended to become Chancellor Gerhard Schröder's main challenger in the 2002 election. Merkel's own ambition to become Chancellor was well-known, but she lacked the support of most Minister-presidents and other grandees within her own party. She was subsequently outmaneuvered politically by CSU Leader Edmund Stoiber, to whom she eventually ceded the privilege of challenging Schröder. He went on to squander a large lead in opinion polls to lose the election by a razor-thin margin in an election campaign that was dominated by the Iraq War. While Chancellor Schröder made clear he would not join the war in Iraq, Merkel and the CDU-CSU supported the invasion of Iraq. After Stoiber's defeat in 2002, in addition to her role as CDU Leader, Merkel became Leader of the Opposition in the Bundestag; Friedrich Merz, who had held the post prior to the 2002 election, was eased out to make way for Merkel. Merkel advocated a strong transatlantic partnership and German-American friendship. In the spring of 2003, defying strong public opposition, Merkel came out in favour of the U.S. invasion of Iraq, describing it as "unavoidable" and accusing Chancellor Gerhard Schröder of anti-Americanism. She criticised the government's support for the accession of Turkey to the European Union and favoured a "privileged partnership" instead. In doing so, she reflected public opinion that grew more hostile toward Turkish membership of the European Union. On 30 May 2005, Merkel won the CDU/CSU nomination as challenger to Chancellor Gerhard Schröder of the SPD in the 2005 national elections. Her party began the campaign with a 21-point lead over the SPD in national opinion polls, although her personal popularity lagged behind that of the incumbent. However, the CDU/CSU campaign suffered when Merkel, having made economic competence central to the CDU's platform, confused gross and net income twice during a televised debate. She regained some momentum after she announced that she would appoint Paul Kirchhof, a former judge at the German Constitutional Court and leading fiscal policy expert, as Minister of Finance. Merkel and the CDU lost ground after Kirchhof proposed the introduction of a flat tax in Germany, again undermining the party's broad appeal on economic affairs and convincing many voters that the CDU's platform of deregulation[citation needed] was designed to benefit only the rich. This was compounded by Merkel's proposal to increase VAT to reduce Germany's deficit and fill the gap in revenue from a flat tax. The SPD were able to increase their support simply by pledging not to introduce flat taxes or increase VAT. [citation needed] Although Merkel's standing recovered after she distanced herself from Kirchhof's proposals, she remained considerably less popular than Schröder,[citation needed] and the CDU's lead was down to 9% on the eve of the election. On the eve of the election, Merkel was still favored to win a decisive victory based on opinion polls. On 18 September 2005, Merkel's CDU/CSU and Schröder's SPD went head-to-head in the national elections, with the CDU/CSU winning 35.2% (CDU 27.8%/CSU 7.5%)[citation needed] of the second votes to the SPD's 34.2%. The result was so close, both Schröder and Merkel claimed victory. Neither the SPD-Green coalition nor the CDU/CSU and its preferred coalition partners, the Free Democratic Party, held enough seats to form a majority in the Bundestag. A grand coalition between the CDU/CSU and SPD faced the challenge that both parties demanded the chancellorship. However, after three weeks of negotiations, the two parties reached a deal whereby Merkel would become Chancellor and the SPD would hold 8 of the 16 seats in the cabinet. On 22 November 2005, Merkel assumed the office of Chancellor of Germany following a stalemate election that resulted in a grand coalition with the SPD. The coalition deal was approved by both parties at party conferences on 14 November 2005. Merkel was elected Chancellor by the majority of delegates (397 to 217) in the newly assembled Bundestag on 22 November 2005, but 51 members of the governing coalition voted against her. Reports at the time indicated that the grand coalition would pursue a mix of policies, some of which differed from Merkel's political platform as leader of the opposition and candidate for Chancellor. The coalition's intent was to cut public spending whilst increasing VAT (from 16 to 19%), social insurance contributions and the top rate of income tax. Her party was re-elected in 2009 with an increased number of seats, and could form a governing coalition with the FDP. This term was overshadowed by the European debt crisis. Conscription in Germany was abolished and the Bundeswehr became a Volunteer military. Unemployment sank below the mark of 3 million unemployed people. In the 2017 election, Merkel led her party to victory for the fourth time. Both CDU/CSU and SPD received a significantly lower proportion of the vote than they did in the 2013 election. and attempted to form a coalition with the FDP and Greens. The collapse of these talks led to stalemate. The German President Frank-Walter Steinmeier subsequently appealed successfully to the SPD to change their hard stance and to agree a 3rd grand coalition with the CDU/CSU. In 2019 media speculation persists that that Merkel's successor as party leader, Annegret Kramp-Karrenbauer may take over Merkel's position as chancellor sooner than planned if the current governing coalition proves unsustainable. The possibility is neither confirmed nor denied by the party. During the Syrian Civil War, Merkel pledged to give refuge in Germany to Syrians who are fleeing the fighting, discontinuing the enforcement of EU regulations for asylum seekers. This policy is regarded by some as having set off the 2015 European migrant crisis. During the crisis, the number of people coming from African nations as well as from countries in the Middle East, outside the war zone, such as Afghanistan and Iran, rose significantly. On 1 July 2018, German Interior minister Horst Seehofer offered to resign after rejecting Chancellor Angela Merkel's EU migration deal. Merkel meets with Argentine President Mauricio Macri in the Casa Rosada, Buenos Aires, 2017. Merkel's foreign policy has focused on strengthening European cooperation and international trade agreements. Merkel has been widely described as the de facto leader of the European Union throughout her tenure as Chancellor. One of Merkel's priorities was strengthening transatlantic economic relations. She signed the agreement for the Transatlantic Economic Council on 30 April 2007 at the White House. Merkel enjoyed good relations with U.S. Presidents George W. Bush, and Barack Obama. Obama described her in 2016 as his "closest international partner" throughout his tenure as President. On 25 September 2007, Merkel met the 14th Dalai Lama for "private and informal talks" in the Chancellery in Berlin amid protest from China. China afterwards cancelled separate talks with German officials, including talks with Justice Minister Brigitte Zypries. In 2006, Merkel expressed concern about overreliance on Russian energy, but she received little support from others in Berlin. Merkel favors the Association Agreement between Ukraine and the European Union; but stated in December 2012 that its implementation depends on reforms in Ukraine. In recognition of the importance of China to the German economy, by 2014 Merkel had led seven trade delegations to China since assuming office in 2005. The same year, in March, China's President Xi Jinping visited Germany. In 2015, with the absence of Stephen Harper, Merkel became the only leader to have attended every G20 meeting since the very first in 2008, having been present at a record thirteen summits as of 2018. She hosted the twelfth meeting at the 2017 G20 Hamburg summit. In June 2017, Merkel criticized the draft of new U.S. sanctions against Russia that target EU–Russia energy projects, including Nord Stream 2 gas pipeline. In June 2018, Merkel said that there had been "no moral or political justification" for the post-war expulsion of ethnic Germans from Central and Eastern European countries. Following major falls in worldwide stock markets in September 2008, the German government stepped in to assist the mortgage company Hypo Real Estate with a bailout, which was agreed on 6 October, with German banks to contribute €30 billion and the Bundesbank €20 billion to a credit line. On 4 October 2008, following the Irish Government's decision to guarantee all deposits in private savings accounts, a move she strongly criticised, Merkel said there were no plans for the German Government to do the same. The following day, Merkel stated that the government would guarantee private savings account deposits, after all. However, two days later, on 6 October 2008, it emerged that the pledge was simply a political move that would not be backed by legislation. Other European governments eventually either raised the limits or promised to guarantee savings in full. She produces graphs of unit labour costs ... at EU meetings in much the same way that the late Margaret Thatcher used to pull passages from Friedrich Hayek's Road to Serfdom from her handbag. The first cabinet of Angela Merkel was sworn in at 16:00 CET on 22 November 2005. On 31 October 2005, after the defeat of his favoured candidate for the position of Secretary General of the SPD, Franz Müntefering indicated that he would resign as party chairman, which he did in November. Ostensibly responding to this, Edmund Stoiber (CSU), who was originally nominated as Minister for Economics and Technology, announced his withdrawal on 1 November 2005. While this was initially seen as a blow to Merkel's attempt at forming a viable coalition, the manner in which Stoiber withdrew earned him much ridicule and severely undermined his position as a Merkel rival. Separate conferences of the CDU, CSU, and SPD approved the proposed Cabinet on 14 November 2005. The second Cabinet of Angela Merkel was sworn in on 28 October 2009. In 2013, Merkel won one of the most decisive victories in German history, achieving the best result for the CDU/CSU since reunification and coming within five seats of the first absolute majority in the Bundestag since 1957. However, with their preferred coalition partner, the FDP, failing to enter parliament for the first time since 1949, the CDU/CSU turned to the SPD to form the third grand coalition in postwar German history and the second under Merkel's leadership. The third Cabinet of Angela Merkel was sworn in on 17 December 2013. The fourth cabinet of Angela Merkel is the current government of Germany, and was sworn in on 14 March 2018 after. The negotiations that led to a Grand Coalition agreement with the Social Democracts (SPD) were the longest in German post-war history, lasting almost six months. Midway through her second term, Merkel's approval plummeted in Germany, resulting in heavy losses in state elections for her party. An August 2011 poll found her coalition had only 36% support compared to a rival potential coalition's 51%. However, she scored well on her handling of the recent euro crisis (69% rated her performance as good rather than poor), and her approval rating reached an all-time high of 77% in February 2012 and again in July 2014. Merkel's approval rating dropped to 54% in October 2015, during the European migrant crisis, the lowest since 2011. According to a poll conducted after terror attacks in Germany Merkel's approval rating dropped to 47% (August 2016). Half of Germans did not want her to serve a fourth term in office compared to 42% in favor. However, according to a poll taken in October 2016, her approval rating had been found to have risen again, 54% of Germans were found to be satisfied with work of Merkel as Chancellor. According to another poll taken in November 2016, 59% were to found to be in favour of a renewed Chancellor candidature of Merkel in 2017. According to a poll carried out just days after the 2016 Berlin attack, in which it was asked which political leader(s) Germans trust to solve their country's problems; 56% named Merkel, 39% Seehofer (CSU), 35% Gabriel (SPD), 32% Schulz (SPD), 25% Özdemir (Greens), 20% Wagenknecht (Left party), 15% Lindner (FDP), and just 10% for Petry (AfD). A YouGov survey published in late December 2017 found that just 36 percent of all respondents want Merkel to stay at the helm until 2021, while half of those surveyed voters called for a change at the top before the end of the legislature. Merkel has been widely described as the de facto leader of the European Union throughout her tenure as Chancellor. Merkel has twice been named the world's second most powerful person following Vladimir Putin by Forbes magazine, the highest ranking ever achieved by a woman. On 26 March 2014, Merkel became the longest-serving incumbent head of government in the European Union. In December 2015, Merkel was named as Time magazine's Person of the Year, with the magazine's cover declaring her to be the "Chancellor of the Free World". In 2018, Merkel was named the most powerful woman in the world for a record fourteenth time by Forbes. Following the election of Donald Trump to the U.S. presidency in November 2016, Merkel was described by The New York Times as "the Liberal West's Last Defender". Since 2016 she has been described by many commentators as the "leader of the free world". Former US Secretary of State Hillary Clinton described Merkel in 2017 as "the most important leader in the free world." She is currently the senior G7 leader. On 29 October 2018, Merkel announced that she would not seek reelection as leader of CDU at their party conference in December 2018, but intends to remain as chancellor until 2021, when the next German federal election, at the latest, is to be held. She stated that she does not plan to seek any political office after this. The resignations followed October setbacks for the CSU in the Bavarian state election and for the CDU in the Hessian state election. She decided not to suggest any person as her successor as leader of the CDU. In 1977, at the age of 23, Merkel, then Angela Kasner, married physics student Ulrich Merkel and took his surname. The marriage ended in divorce in 1982. Her second and current husband is quantum chemist and professor Joachim Sauer, who has largely remained out of the media spotlight. They first met in 1981, became a couple later and married privately on 30 December 1998. She has no children, but Sauer has two adult sons from a previous marriage. Merkel is a fervent football fan and has been known to listen to games while in the Bundestag and to attend games of the national team in her official capacity. Merkel stated that her favorite movie is The Legend of Paul and Paula, an East German movie released in 1973. Merkel has a fear of dogs after being attacked by one in 1995. Vladimir Putin, in a move reminiscent of Germany's first chancellor, brought in his Labrador Retriever during a press conference in 2007. Putin claims he did not mean to scare her, though Merkel later observed, "I understand why he has to do this – to prove he's a man. [...] He's afraid of his own weakness." Merkel speaking at the 2011 German Evangelical Church Assembly in Dresden. Angela Merkel is a Lutheran member of the Evangelical Church in Berlin, Brandenburg and Silesian Upper Lusatia (German: Evangelische Kirche Berlin-Brandenburg-schlesische Oberlausitz – EKBO), a United Protestant (i.e. both Reformed and Lutheran) church body under the umbrella of the Evangelical Church in Germany (EKD). The EKBO is a church of the Union of Evangelical Churches. Before the 2004 merger of the Evangelical Church in Berlin-Brandenburg and the Evangelical Church in Silesian Upper Lusatia (both also being a part of the EKD), she belonged to the former. In 2012, Merkel said, regarding her faith: "I am a member of the evangelical church. I believe in God and religion is also my constant companion, and has been for the whole of my life. We as Christians should above all not be afraid of standing up for our beliefs." She also publicly declared that Germany suffers not from "too much Islam" but "too little Christianity". In 2007, Merkel was awarded an honorary doctorate from the Hebrew University of Jerusalem. University of Technology in Wrocław (Poland) in September 2008 and Babeș-Bolyai University from Cluj-Napoca, Romania on 12 October 2010 for her historical contribution to the European unification and for her global role in renewing international cooperation. On 23 May 2013, she was awarded an honorary doctorate from the Radboud University Nijmegen. In November 2013, she was awarded the Honorary Doctorate (Honoris Causa) title by the University of Szeged. In November 2014, she was awarded the title Doctor Honoris Causa by Comenius University in Bratislava. In September 2015, she was awarded the title Doctor Honoris Causa by the University of Bern. In January 2017, she was awarded the title Doctor Honoris Causa jointly by the Ghent University and Katholieke Universiteit Leuven. In May 2017, Merkel was awarded the title of Doctrix Honoris Causa by the University of Helsinki. In 2006, Angela Merkel was awarded the Vision for Europe Award for her contribution toward greater European integration. She received the Karlspreis (Charlemagne Prize) in 2008 for distinguished services to European unity. In March 2008, she received the B'nai B'rith Europe Award of Merit. Merkel topped Forbes magazine's list of "The World's 100 Most Powerful Women" in 2006, 2007, 2008, 2009, 2011, 2012, 2013, 2014, 2015, 2016, 2017, and 2018. New Statesman named Angela Merkel in "The World's 50 Most Influential Figures" 2010. On 16 June 2010, the American Institute for Contemporary German Studies at Johns Hopkins University in Washington D.C. awarded Chancellor Merkel its Global Leadership Award (AICGS) in recognition of her outstanding dedication to strengthening German-American relations. On 21 September 2010, the Leo Baeck Institute, a research institution in New York City devoted to the history of German-speaking Jewry, awarded Angela Merkel the Leo Baeck Medal. The medal was presented by former U.S. Secretary of the Treasury and current Director of the Jewish Museum Berlin, W. Michael Blumenthal, who cited Merkel's support of Jewish cultural life and the integration of minorities in Germany. On 31 May 2011, she received the Jawaharlal Nehru Award for the year 2009 from the Indian government. She received the award for International understanding. In December 2015, she was named Time magazine's Person of the Year. As a female politician from a centre right party who is also a scientist, Merkel has been compared by many in the English-language press to former British Prime Minister Margaret Thatcher. Some have referred to her as "Iron Lady", "Iron Girl", and even "The Iron Frau," all alluding to Thatcher, whose nickname was "The Iron Lady" (Thatcher also had a science degree from Oxford University in chemistry). Political commentators have debated the precise extent to which their agendas are similar. Later in her tenure, Merkel acquired the nickname "Mutti" (a German familiar form of "mother"). She has also been called the "Iron Chancellor", in reference to Otto von Bismarck. By opening Germany's borders to immigrants and refugees, primarily from the Middle East and Africa, many critics have blamed Merkel for encouraging the mass migration into Europe. Merkel has been criticised for being personally present and involved at the M100 Media Award handover to Danish cartoonist Kurt Westergaard, who had triggered the Muhammad cartoons controversy. This happened at a time of fierce emotional debate in Germany over a book by the former Deutsche Bundesbank executive and finance senator of Berlin Thilo Sarrazin, which was critical of the Muslim immigration. At the same time she condemned a planned burning of Korans by a fundamental pastor in Florida. The Central Council of Muslims in Germany and the Left Party (Die Linke) as well as the German Green Party[d] criticised the action by the centre-right chancellor. The Frankfurter Allgemeine Zeitung newspaper wrote: "This will probably be the most explosive moment of her chancellorship so far." Others have praised Merkel and called it a brave and bold move for the cause of freedom of speech. Merkel's position towards the negative statements by Thilo Sarrazin with regard to the integration problems with Arab and Turkish people in Germany has been critical throughout. According to her personal statements, Sarrazin's approach is "totally unacceptable" and counterproductive to the ongoing problems of integration. The term alternativlos (German for "without an alternative"), which was frequently used by Angela Merkel to describe her measures addressing the European sovereign-debt crisis, was named the Un-word of the Year 2010 by a jury of linguistic scholars. The wording was criticised as undemocratic, as any discussion on Merkel's politics would thus be deemed unnecessary or undesirable. The expression is credited for the name of the political party Alternative for Germany, which was founded in 2013. In July 2013, Merkel defended the surveillance practices of the National Security Agency, and described the United States as "our truest ally throughout the decades". During a visit of U.S. President Barack Obama in Berlin, Merkel said on 19 June 2013 in the context of the 2013 mass surveillance disclosures: "The Internet is uncharted territory for us all". (German: Das Internet ist Neuland für uns alle.) This statement led to various internet memes and online mockery of Merkel. Merkel compared the NSA to the Stasi when it became known that her mobile phone was tapped by that agency. In response, Susan Rice pledged that the U.S. will desist from spying on her personally, but said there would not be a no-espionage agreement between the two countries. Her statement "Islam is part of Germany" during a state visit of the Turkish prime minister Ahmet Davutoğlu in January 2015 induced criticism within her party. The parliamentary group leader Volker Kauder said that Islam is not part of Germany and that Muslims should deliberate on the question why so many violent people refer to the Quran. In October 2015, Horst Seehofer, Bavarian State Premier and leader of CSU, the sister party of Merkel's CDU, criticised Merkel's policy of allowing in hundreds of thousands of migrants from the Middle East: "We're now in a state of mind without rules, without system and without order because of a German decision." Seehofer attacked Merkel policies in sharp language, threatened to sue the government in the high court, and hinted that the CSU might topple Merkel. Many MPs of Merkel's CDU party also voices dissatisfaction with Merkel. Chancellor Merkel insisted that Germany has the economic strength to cope with the influx of migrants and reiterated that there is no legal maximum limit on the number of migrants Germany can take. At the conclusion of the May 2017 Group of Seven's leaders in Sicily, Merkel criticised American efforts to renege on earlier commitments on climate change. According to Merkel, the discussions were difficult and marred by dissent. "Here we have the situation where six members, or even seven if you want to add the EU, stand against one." Merkel features as a main character in two of the three plays that make up the Europeans Trilogy (Bruges, Antwerp, Tervuren) by Paris-based UK playwright Nick Awde: Bruges (Edinburgh Festival, 2014) and Tervuren (2016). A character named Merkel, accompanied by a sidekick called Schäuble, also appears as the sinister female henchman in Michael Paraskos's novel In Search of Sixpence. On the American sketch-comedy Saturday Night Live, she has been parodied by Kate McKinnon since 2013. On the British sketch-comedy Tracey Ullman's Show, comedian Tracey Ullman has parodied Merkel to international acclaim with German media dubbing her impersonation as the best spoof of Merkel in the world. In 2016, a documentary film Angela Merkel – The Unexpected, a story about her unexpected rise to power from an East German physicist to the most powerful woman in the world, was produced by Broadview TV and MDR in collaboration with Arte and Das Erste. Merkel was portrayed by Swiss actress Anna Katarina in the 2012 political satire film The Dictator. ^ The English pronunciation of her first name could be /ˈæŋɡələ, ˈɑːŋ-/, and that of her last name /ˈmɜːrkəl, ˈmɛərkəl/. In German, her last name is pronounced [ˈmɛɐ̯kl̩]. There are different ways to pronounce the name Angela in German. The Duden Pronunciation Dictionary lists [ˈaŋɡela] and [aŋˈɡeːla]. According to her biographer, Merkel prefers the pronunciation with stress on the second syllable ([aŋˈɡeːla] with a long /eː/). ^ "Angela Merkel: Her bio in brief". Christian Science Monitor. 20 September 2013. ^ "Merkel". Collins English Dictionary. HarperCollins. Retrieved 7 April 2019. ^ "Merkel, Angela" (US) and "Merkel, Angela". Oxford Dictionaries. Oxford University Press. Retrieved 7 April 2019. ^ "Merkel". Merriam-Webster Dictionary. Retrieved 7 April 2019. ^ a b Vick, Karl (2015). "Time Person of the Year 2015: Angela Merkel". Time. Retrieved 30 April 2017. ^ "The World's Most Powerful Women 2018". Forbes. Retrieved 30 December 2018. ^ a b AFP. "Merkel: From austerity queen to 'leader of free world'". www.timesofisrael.com. Retrieved 30 December 2018. ^ a b "German Chancellor Angela Merkel, the newly christened 'leader of the free world,' is preparing to step back from politics — and experts say 'the coming storm is ... quite powerful'". nordic.businessinsider.com. 29 October 2018. Retrieved 30 December 2018. ^ a b Clarke, Hilary (30 October 2018). "For years, Angela Merkel saw off all challengers. Now, she's preparing to step aside". CNN. Retrieved 30 December 2018. ^ a b Moulson, Geir; Rising, David (29 October 2018). "Merkel won't seek a 5th term as German chancellor". AP NEWS. Retrieved 30 December 2018. ^ "Germany's Merkel begins new term". BBC. 28 October 2009. Archived from the original on 31 October 2009. Retrieved 1 November 2009. ^ a b "German Chancellor Angela Merkel makes a hat-trick win in 2013 Elections". Archived from the original on 26 September 2013. Retrieved 23 September 2013. ^ Oltermann, Philip; Connolly, Kate (14 March 2018). "Angela Merkel faces multiple challenges in her fourth term". the Guardian. ^ "Angela Merkel faces outright rebellion within her own party over refugee crisis". The Telegraph. Retrieved 24 January 2016. ^ a b "Angela Merkel to step down in 2021". BBC News. 29 October 2018. Retrieved 29 October 2018. ^ Langguth, Gerd (August 2005). Angela Merkel. DTV (in German). p. 10. ISBN 3423244852. ^ "Merkels Vater gestorben – Termine abgesagt" (in German). newsecho. 3 September 2011. Archived from the original on 14 December 2011. Retrieved 8 September 2011. ^ "Picturing the Family: Media, Narrative, Memory | Research". ^ a b Kornelius, Stefan (10 September 2013). "Six things you didn't know about Angela Merkel". The Guardian. Archived from the original on 10 September 2013. Retrieved 29 October 2013. ^ "The German chancellor's Polish roots". Deutsche Welle. Archived from the original on 3 May 2013. ^ "Merkel hat polnische Wurzeln" [Merkel has Polish roots]. Süddeutsche Zeitung. 13 March 2013. Archived from the original on 6 September 2013. ^ "Ahnenforschung: Kanzlerin Angela Merkel ist zu einem Viertel Polin". Die Welt (in German). ^ Boyes, Roger (25 July 2005). "Angela Merkel: Forged in the Old Communist East, Germany's Chancellor-in-Waiting Is Not like the Others". New Statesman. ^ a b Werner, Reutter (1 December 2005). "Who's Afraid of Angela Merkel? : The Life, Political Career, and Future of the New German Chancellor". International Journal. 61. ^ Vasagar, Jeevan (1 September 2013). "Angela Merkel, the girl who never wanted to stand out, to win big again". The Daily Telegraph. Retrieved 19 April 2017. ^ Patterson, Tony (17 November 2015). "Angela Merkel's journey from Communist East Germany to Chancellor". The Independent. Retrieved 19 April 2017. ^ "Angela Merkel – Biography, Political Career & Facts". britannica.com. ^ "5 Things to Know About Germany's Angela Merkel". Associated Press. 2017. ^ a b "How Close Was Merkel to the Communist System?". Der Spiegel. 2013. ^ Langguth, Gerd (August 2005). Angela Merkel (in German). DTV. p. 50. ISBN 3423244852. ^ "Drogenwahn auf der Dauerbaustelle". Der Spiegel (in German). 27 March 2009. Archived from the original on 13 January 2010. Retrieved 19 August 2011. ^ a b Crawford, Alan; Czuczka, Tony (20 September 2013). "Angela Merkel's Years in East Germany Shaped Her Crisis Politics". Bloomberg L.P. Retrieved 29 April 2017. ^ "I Was a Squatter, Reveals German Chancellor Merkel". Deutsche Welle. 28 February 2008. ^ "Scopus preview – Scopus – Author details (Merkel, Angela)". scopus.com. Retrieved 19 July 2016. ^ Wie Angela Merkel beinahe Thüringerin wurde Thüringer Allgemeine (in German) 17 July 2014. ^ a b Huggler, Justin (9 October 2015). "10 moments that define German chancellor Angela Merkel". The Daily Telegraph. Retrieved 29 April 2017. ^ "Merkel wirbt für gute Finanzausstattung der Kommunen". Focus Online (in German). 6 January 2010. Retrieved 29 April 2017. ^ a b c d Packer, George (1 December 2014). "The Astonishing Rise of Angela Merkel". The New Yorker. Retrieved 30 April 2017. ^ "Kohls unterschätztes Mädchen". Der Spiegel (in German). 30 May 2005. Archived from the original on 18 July 2009. Retrieved 19 August 2011. ^ Qvortrup, Matthew (2016). Angela Merkel: Europe's Most Influential Leader. The Overlook Press. ISBN 978-1468314083. ^ Schroeder wins second term CNN, 23 September 2002. ^ "Opposition meltdown: The great disintegration act". Der Spiegel. 22 October 2004. Retrieved 28 November 2015. ^ "Merkel fordert längere Arbeitszeit". Der Spiegel (in German). 18 May 2003. Archived from the original on 13 June 2008. Retrieved 27 August 2011. ^ "Merkel: Nuclear phase-out is wrong". World Nuclear News. 10 June 2008. Archived from the original on 16 June 2011. Retrieved 27 August 2011. ^ a b Saunders, Doug (14 September 2005). "Popular flat-tax movement hits brick wall in Germany". The Globe and Mail. Retrieved 28 November 2015. ^ Volkery, Carsten (3 August 2005). "CDU-Panne: Brutto, netto, Merkel". Der Spiegel. Retrieved 19 May 2017. ^ Crawford, Alan; Czuczka, Tony (12 June 2013). Angela Merkel: A Chancellorship Forged in Crisis. John Wiley & Sons. ISBN 978-1118641095. ^ Harding, Luke (11 July 2005). "Merkel unveils tax-raising manifesto". The Guardian. ISSN 0261-3077. Retrieved 7 May 2017. ^ "Germany votes in close election". BBC. 18 September 2005. Retrieved 3 May 2017. ^ a b c d e "German election ends in stalemate". BBC. 19 September 2005. Retrieved 5 May 2017. ^ a b "Merkel named as German chancellor". BBC News. 10 October 2005. Archived from the original on 23 September 2013. Retrieved 27 August 2011. ^ "German parties back new coalition". BBC News. 14 November 2005. Archived from the original on 11 January 2009. ^ "Merkel becomes German chancellor". BBC News. 22 November 2005. Archived from the original on 9 December 2005. ^ "German coalition poised for power". BBC News. 11 November 2005. Archived from the original on 25 November 2005. ^ "Merkel defends German reform plan". BBC News. 12 November 2005. Archived from the original on 15 March 2006. ^ "Arbeitsmarkt: Arbeitslosigkeit 2011 meist unter drei Millionen" [Labour market: Unemployment in 2011 mostly below three million]. Focus online (in German). 27 October 2010. ^ "Angela Merkel reaches deal with SPD to form German-Grand-Coalition". Independent. 27 November 2013. Retrieved 23 December 2017. ^ "Koalition: Merkel lädt ab Mittwoch kommender Woche zu Jamaika-Gesprächen". 9 October 2017 – via Spiegel Online. ^ Paun, Carmen (7 October 2017). "Angela Merkel Ready to Move Forward with Jamaica Coalition". Politico. Retrieved 9 October 2017. ^ Connolly, Kate (24 November 2017). "Germany's SPD is ready for talks to end coalition deadlock". Berlin: The Guardian. Retrieved 24 November 2017. ^ "Bundestag wählt Angela Merkel zum vierten Mal zur Bundeskanzlerin". Neue Zürcher Zeitung. 14 March 2018. Retrieved 5 April 2019. ^ Torsten Krauel, Chefkommentator (12 March 2019). "Kanzlerin Kramp-Karrenbauer? Eine Gespensterdebatte". Axel Springer SE (WELT und N24Doku), Berlin. Retrieved 5 April 2019. ^ ""Ich will, dass Angela Merkel Kanzlerin bleibt"". Kramp-Karrenbauer zur Kanzlerindebatte .... Die CDU-Vorsitzende Annegret Kramp-Karrenbauer weist die Spekulationen um ein Ende der Ära Angela Merkel als Kanzlerin zurück. Sie halte die Stimmen für nicht relevant, die sich zu dem Thema äußerten. Der Spiegel (online). 11 March 2019. Retrieved 5 April 2019. ^ "Angela Merkel's coalition is in trouble. That means Europe is, too". The Economist. Retrieved 25 October 2018. ^ "Merkel says German multicultural society has failed". BBC News. 17 October 2010. Archived from the original on 17 October 2010. ^ "Merkel Says German Multi-Cultural Society Has Failed". Yahoo! News. 17 October 2007. Archived from the original on 18 October 2010. Retrieved 18 December 2013. ^ "Germany's charged immigration debate". BBC News. 17 October 2010. Archived from the original on 14 October 2010. ^ a b Holehouse, Matthew; Huggler, Justin; Vogt, Andrea (24 August 2015). "Germany drops EU rules to allow in Syrian refugees". The Telegraph. Retrieved 16 June 2017. ^ a b Bajekal, Naina (9 September 2015). "The 5 Big Questions About Europe's Migrant Crisis". Time. Retrieved 16 June 2017. ^ "Merkel coalition crisis: Seehofer offers to quit over migration". www.aljazeera.com. Retrieved 12 July 2018. ^ "Merkel ally offers to quit over migrants". 2 July 2018. Retrieved 12 July 2018 – via www.bbc.com. ^ Oltermann, Philip; Chrisafis, Angelique; Connolly, Kate (2 July 2018). "Merkel and Seehofer make last-ditch bid for migration compromise". the Guardian. Retrieved 12 July 2018. ^ "Enterprise policies" (PDF). European Council. Retrieved 11 September 2012. ^ "Germany has 'given up' on Donald Trump acting like a President". 23 January 2017. ^ "Obama: Merkel was my closest ally". The Local. 15 November 2016. ^ "Merkel meets with the Dalai Lama". Euronews. Archived from the original on 12 January 2009. Retrieved 2 March 2010. ^ "Dependence on Russian gas worries some – but not all – European countries". The Christian Science Monitor. 6 March 2008. Archived from the original on 8 November 2011. Retrieved 23 August 2011. ^ "Klitschko, Merkel discuss prospects for signing EU-Ukraine association agreement". Kyiv Post. Interfax-Ukraine. 5 December 2012. Archived from the original on 5 December 2012. ^ "Angela Merkel sets off for China to forge new economic ties". Herald Globe. Archived from the original on 14 July 2014. Retrieved 5 July 2014. ^ "G20-Gipfel in Hamburg: Merkel nennt erstmals Themen". Hamburger Abendblatt. Retrieved 12 September 2016. ^ "Germany's Angela Merkel slams planned US sanctions on Russia". Deutsche Welle. 16 June 2017. ^ "Merkel calls Sudeten German expulsion "immoral", drawing Czech ire". Czech Radio. 21 June 2018. ^ Parkin, Brian; Suess, Oliver (6 October 2008). "Hypo Real Gets EU50 Billion Government-Led Bailout". Bloomberg. Archived from the original on 22 October 2012. Retrieved 6 October 2008. ^ Dougherty, Carter. "Germany guarantees all private bank accounts". Forbes. Archived from the original on 23 April 2014. Retrieved 6 October 2008. ^ Whitlock, Craig (6 October 2008). "Germany to guarantee Private Bank Accounts". The Washington Post. Retrieved 6 October 2008. ^ a b "Bank uncertainty hits UK shares". BBC News. 6 October 2008. Archived from the original on 7 October 2008. Retrieved 6 October 2008. ^ "Bundesregierung | Rede von Bundeskanzlerin Merkel beim Jahrestreffen 2013 des World Economic Forum" (in German). Bundesregierung.de. 24 January 2013. Retrieved 24 February 2016. ^ Among others, in her speech on the occasion of her honorary doctoral degree at the University of Szeged in Hungary, see http://www.bundesregierung.de/Content/DE/Rede/2015/02/2015-02-02-merkel-budapest.html. ^ a b "The Merkel plan". The Economist. 15 June 2013. Retrieved 24 February 2016. ^ Peel, Quentin (16 December 2012). "Merkel warns on cost of welfare". Financial Times. Retrieved 24 February 2016. ^ Penfold, Chuck (30 October 2009). "Merkel's new cabinet sworn in". Deutsche Welle. Archived from the original on 1 June 2010. Retrieved 1 November 2009. ^ Connolly, Kate; Oltermann, Philip (23 September 2013). "German election: Angela Merkel secures historic third win". The Guardian. ISSN 0261-3077. Retrieved 26 March 2017. ^ Müller, Volker. "Deutscher Bundestag - Bundeskanzlerin und Bundeskabinett vereidigt". Deutscher Bundestag (in German). Retrieved 14 December 2018. ^ Müller, Volker. "Deutscher Bundestag - Angela Merkel mit 364 Stimmen zur Bundeskanzlerin gewählt". Deutscher Bundestag (in German). Retrieved 14 December 2018. ^ Welle (www.dw.com), Deutsche. "Germany's never-ending coalition talks break record | DW | 20 December 2017". DW.COM. Retrieved 14 December 2018. ^ Oltermann, Philip (4 March 2018). "Merkel secures fourth term in power after SPD backs coalition deal". The Guardian. ISSN 0261-3077. Retrieved 14 December 2018. ^ Pidd, Helen (21 February 2011). "Angela Merkel's party crushed in Hamburg poll". The Guardian. London. Archived from the original on 24 February 2011. Retrieved 23 August 2011. ^ "German opposition hits 11-year high in polls". France 24. 5 August 2011. Archived from the original on 11 October 2011. Retrieved 23 August 2011. ^ "Union dank Merkel im Umfrage-Aufwind". Stern (in German). 10 February 2012. Archived from the original on 12 February 2012. Retrieved 12 February 2012. ^ tagesschau.de. "ARD-Deutschlandtrend: Mehrheit gegen EU-Beitritt der Türkei". tagesschau.de (in German). Retrieved 9 November 2016. ^ Turner, Zeke; Fairless, Tom (28 August 2016). "Half of Germans Oppose Fourth Term for Angela Merkel, Survey Finds". The Wall Street Journal. Retrieved 29 August 2016. ^ "ARD-DeutschlandTrend: Merkel überwindet ihr Tief" [ARD-DeutschlandTrend: Merkel overcomes her low point.] (in German). ARD-tagesschau. 6 October 2016. Retrieved 9 November 2016. ^ "Forsa-Umfrage: Mehrheit für erneute Kanzlerkandidatur Merkels" [Forsa Poll: Majority for renewed chancellor candidature of Merkel]. N24.de (in German). Retrieved 9 November 2016. ^ Gaugele, Jochen; Kammholz, Karsten (27 December 2016). "Flüchtlingskrise wird 2017 die größte Herausforderung" [Refugee crisis to be biggest challenge in 2017]. Berliner Morgenpost (in German). Retrieved 27 December 2016. ^ "Waning support puts Merkel's future in doubt". Handelsblatt Global. Retrieved 29 December 2017. ^ Balasubramanyam, Ranjitha (16 September 2013). "All Eyes on Berlin". Foreign Policy Journal. Retrieved 23 September 2013. ^ Francis, David (22 September 2013). ""Mama" Merkel May Win Germany, But Not the Euro Zone". The Fiscal Times. Retrieved 22 September 2013. ^ Wagele, Elizabeth (16 July 2012). "What Personality Type is Angela Merkel?". Psychology Today. Retrieved 23 September 2013. ^ "Angela Merkel 'world's most powerful woman'". The Daily Telegraph. London. 24 August 2011. ^ "Profile Angela Merkel". Forbes. 18 April 2012. Retrieved 11 September 2012. ^ Gibbs, Nancy (9 December 2015). "Why Angela Merkel is TIME's Person of the Year". Retrieved 9 December 2015. ^ "Angela Merkel". Forbes. Retrieved 5 December 2018. ^ Smale, Alison; Erlanger, Steven (12 November 2016). "As Obama Exits World Stage, Angela Merkel May Be the Liberal West's Last Defender". The New York Times. ^ Ali, Yashar (24 September 2017). "Clinton Says Angela Merkel Is The Most Important Leader In The Free World" – via Huff Post. ^ Le Blond, Josie (29 October 2018). "German chancellor Angela Merkel will not seek re-election in 2021". the Guardian. Retrieved 29 October 2018. ^ Geir Moulson; David Rising (29 October 2018). "Angela Merkel won't seek 5th term as German chancellor". Associated Press. Archived from the original on 29 October 2018. Retrieved 29 October 2018. ^ "Biographie: Angela Merkel, geb. 1954". DHM. Archived from the original on 25 February 2009. Retrieved 2 March 2010. ^ "Joachim Sauer, das Phantom an Merkels Seite". Die Zeit (in German). 14 August 2009. Archived from the original on 16 August 2009. Retrieved 11 June 2010. ^ "Das diskrete Gluck". Bild (in German). 28 December 2008. Archived from the original on 27 February 2014. Retrieved 11 June 2010. ^ Klatell, James M (9 August 2006). "Germany's First Fella, Angela Merkel Is Germany's Chancellor; But Her Husband Stays Out of the Spotlight". CBS News. Archived from the original on 10 August 2006. Retrieved 2 March 2010. ^ "Angela Merkel im Fußballfieber". Focus (in German). 15 March 2013. Archived from the original on 21 May 2013. Retrieved 24 March 2013. ^ "Kanzlerin Merkel kommt erst wieder zum Finale". Handelsblatt (in German). 23 June 2012. Archived from the original on 27 June 2012. Retrieved 24 March 2013. ^ Welle (www.dw.com), Deutsche. "Merkel reveals politically explosive favorite film | DW | 15 May 2013". DW.COM. Retrieved 14 December 2018. ^ a b CNN, Tim Hume. "Putin: I didn't mean to scare Angela Merkel with dog". CNN. Retrieved 20 July 2016. ^ "Bundeskanzlerin Merkel ohne fertige Antworten in Templin". Archived from the original on 23 November 2016. ^ Spencer, Nick (6 January 2016). "Angela Merkel: How Germany's Iron Chancellor is shaped by her Christianity | Christian News on Christian Today". Christiantoday.com. Retrieved 5 April 2017. "Video Podcast of the German Chancellor #37/2012" (PDF) (in German). 3 November 2012. Ich bin Mitglied der evangelischen Kirche. Ich glaube an Gott, und die Religion ist auch mein ständiger Begleiter – eigentlich in meinem ganzen Leben – gewesen. ^ "Bericht der Vorsitzenden der CDU Deutschlands Bundeskanzlerin Dr. Angela Merkel MdB" [Report of the Chairwoman of the German CDU Federal Chancellor Dr. Angela Merkel] (PDF) (in German). 9 September 2011. Es ist doch nicht so, dass wir ein Zuviel an Islam haben, sondern wir haben ein Zuwenig an Christentum. ^ "Bundesverdienstkreuz für Merkel". Tagesschau (in German). Archived from the original on 21 September 2010. Retrieved 21 September 2010. ^ Times, Global. "German Chancellor Merkel visits Bulgaria". www.globaltimes.cn. ^ Cashman, Greer Fay (25 February 2014). "President Peres awards Germany's Merkel Medal of Distinction". The Jerusalem Post. Archived from the original on 25 February 2014. ^ "Merkel Dott.ssa Angela". Quirinale (in Italian). Retrieved 13 August 2016. ^ "Lithuanian president bestows state award upon German chancellor". m.en.delfi.lt. ^ "Dalia Grybauskaite Photo Gallery". gettyimages.co.uk. ^ "Tildelinger av ordener og medaljer". Kongehuset (in Norwegian). Archived from the original on 4 November 2013. ^ "Russell among 15 Presidential Medal of Freedom honorees". National Basketball Association. 18 November 2010. Archived from the original on 20 November 2010. Retrieved 18 April 2011. ^ "Executive Order 11085". Wikisource. Retrieved 1 April 2011. The Medal may be awarded by the President as provided in this order to any person who has made an especially meritorious contribution to (1), the security or national interests of the United States, or (2) world peace, or (3) cultural or other significant public or private endeavors. ^ a.s, Petit Press (7 February 2019). "Merkel awarded for developing relations between Slovakia and Germany". spectator.sme.sk. Retrieved 7 February 2019. ^ "Honorary Doctorates". The Hebrew University of Jerusalem. Archived from the original on 16 October 2008. ^ "Pressemitteilung 2008/106 der Universität Leipzig" (in German). Universität Leipzig. 20 May 2008. Archived from the original on 20 December 2008. Retrieved 2 March 2010. ^ "Doktorat honoris causa dla Merkel". RP (in Polish). 24 September 2008. Archived from the original on 13 May 2012. Retrieved 2 March 2010. ^ "Universitatea Babes-Bolyai". Web.ubbcluj.ro. Archived from the original on 2 September 2011. Retrieved 18 April 2011. 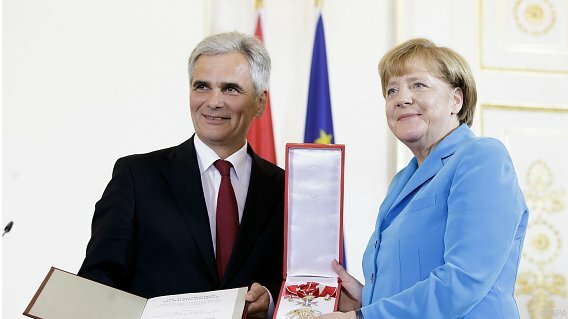 ^ "Angela Merkel a primit titlul de Doctor Honoris Causa al Universităţii Babeş-Bolyai". Realitatea TV. 12 October 2010. Archived from the original on 15 October 2010. Retrieved 18 April 2011. ^ "Cancelarul Germaniei, Angela Merkel, a primit titlul de Doctor Honoris Causa al UBB Cluj". România Liberă (in Romanian). Archived from the original on 15 October 2010. Retrieved 18 April 2011. ^ "Belgien: Ehrendoktor für Angela Merkel". Euronews (in German). 12 January 2017. Retrieved 15 January 2017. ^ Ervasti, Anu-Elina (7 March 2017). "Angela Merkel vihitään Helsingin yliopiston kunniatohtoriksi". Helsingin Sanomat (in Finnish). Retrieved 30 May 2017. ^ "List of the Recipients of the Jawaharlal Nehru Award". Indian Council for Cultural Relations. 2014. Retrieved 13 August 2016. ^ Latham, Mark (5 January 2008). "Angela Merkel awarded the Charlemagne Prize". Aachen. Archived from the original on 6 May 2008. Retrieved 22 April 2014. ^ Riccardi, Andrea. "Der Karlspreisträger 2009" (in German). Karlspreis.de. Archived from the original on 18 December 2008. ^ Serafin, Tatiana (31 August 2006). "The 100 Most Powerful Women: #1 Angela Merkel". Forbes. Archived from the original on 19 April 2009. Retrieved 1 May 2009. Serafin, Tatiana (30 August 2007). "The 100 Most Powerful Women: #1 Angela Merkel". Forbes. Archived from the original on 30 April 2009. Retrieved 17 May 2009. Serafin, Tatiana (27 August 2008). "The 100 Most Powerful Women: #1 Angela Merkel". Forbes. Archived from the original on 19 April 2009. Retrieved 17 May 2009. "Merkel most powerful woman in world: Forbes". Euronews. 26 August 2011. Retrieved 19 December 2011. https://www.forbes.com/profile/angela-merkel/?list=power-women "World's Most Powerful Women". Forbes. Retrieved 29 March 2018. ^ "Angela Merkel – 50 People Who Matter 2010". Archived from the original on 2 October 2010. Retrieved 29 September 2010. ^ "Chancellor Angela Merkel Receives Global Leadership Award". Archived from the original on 21 July 2011. Retrieved 18 December 2013. ^ Baeck, Leo (22 August 2010). "LBI Presents Leo Baeck Medal to Chancellor Angela Merkel". New York: Leo Baeck Institute. Archived from the original on 18 July 2011. Retrieved 18 April 2011. ^ "Angela Merkel Receives Jawaharlal Nehru Award for International Understanding". ABC News. 1 June 2011. Archived from the original on 26 September 2011. Retrieved 16 November 2011. ^ "TIME Person of the Year 2015: Angela Merkel". Time. Retrieved 24 February 2016. ^ "German Chancellor Merkel to Receive Museum's 2017 Elie Wiesel Award". United States Holocaust Memorial Museum. 23 March 2017. Retrieved 25 April 2017. ^ Risen, Clay (5 July 2005). "Is Angela Merkel the next Maggie Thatcher?". Slate. Archived from the original on 28 April 2009. ^ "The new iron chancellor". The Economist. 26 November 2009. Archived from the original on 24 November 2011. ^ Barro, Josh (18 August 2016). "Hillary is America's Merkel, but not in the way Trump thinks". Business Insider. Retrieved 20 December 2016. ^ "Angela Merkel's historic error on immigration". The Daily Telegraph. 15 March 2016. ^ "Merkel honours Mohammad cartoonist at press award". Reuters. 8 September 2010. Archived from the original on 2 October 2012. ^ "The Sarrazin Debate: Germany Is Becoming Islamophobic". Der Spiegel. Archived from the original on 17 September 2011. Retrieved 18 April 2011. ^ Connor, Richard (8 September 2010). "Merkel defends 'Muhammad' cartoonist, condemns Koran-burning". Deutsche Welle. Retrieved 2 May 2014. ^ "Merkel honours Danish Muhammad cartoonist Westergaard". BBC News. 8 September 2010. Archived from the original on 8 September 2010. ^ Buchholz, Christine (9 September 2010). "Merkel's affront to Muslims" (in German). Die linke. Archived from the original on 18 July 2011. Retrieved 18 April 2011. ^ a b "Award for Danish Muhammad Cartoonist: Merkel Defends Press Freedom, Condemns Koran-Burning". Der Spiegel. Archived from the original on 16 September 2011. Retrieved 18 April 2011. ^ "Ehrung des Mohammed-Karikaturisten: Angela Merkels Risiko". Frankfurter Allgemeine Zeitung (in German). 8 September 2010. Archived from the original on 8 September 2010. Retrieved 18 April 2011. ^ "Merkel: Sarrazin spaltet Gesellschaft" (in German). N24 News. Archived from the original on 3 September 2010. Retrieved 14 January 2013. ^ "Sprachkritik: "Alternativlos" ist das Unwort des Jahres". Der Spiegel (in German). 18 January 2011. Archived from the original on 22 September 2013. Retrieved 2 July 2013. ^ Prantl, Heribert (24 September 2013). "Alternative dank Merkel". Süddeutsche Zeitung. Archived from the original on 29 September 2013. Retrieved 2 May 2014. ^ "German Chancellor Merkel Defends Work of Intelligence Agencies". Der Spiegel. 10 July 2013. Archived from the original on 2 May 2014. Retrieved 1 February 2014. ^ "Germany's Merkel rejects NSA-Stasi comparison". Associated Press. 10 July 2013. Archived from the original on 26 August 2013. Retrieved 28 December 2013. ^ Strange, Hannah (20 June 2013). "Angela Merkel refers to internet as 'virgin territory'". The Daily Telegraph. Archived from the original on 6 December 2013. Retrieved 25 October 2013. ^ Frickel, Claudia (20 June 2013). "Merkel beim Besuch von Obama: Das Netz lacht über Merkels "Internet-Neuland"". Der Focus (Online Version) (in German). Archived from the original on 30 September 2013. Retrieved 25 October 2013. ^ Traynor, Ian (17 December 2013). "Merkel compared NSA to Stasi in heated encounter with Obama". The Guardian. Archived from the original on 30 September 2013. Retrieved 2 May 2014. ^ "Merkel defends German intelligence cooperation with NSA". Reuters. 4 May 2015. ^ "Sensible talks urged by Merkel to restore trust with US". Germany News.Net. Archived from the original on 28 July 2014. Retrieved 18 July 2014. ^ "Kauder: 'Der Islam gehört nicht zu Deutschland'" [Kauder: "Islam does not belong to Germany"] (in German). dpa/T-Online. 18 January 2015. Retrieved 20 January 2015. ^ "Viktor Orbán, Bavaria's hardline hero". Politico. 23 September 2015. ^ "Merkel splits conservative bloc with green light to refugees". Reuters. 6 September 2015. ^ "Germany: 'No Limit' To Refugees We'll Take In". Sky News. 5 September 2015. ^ Fouquet, Helene; Delfs, Arne; and Wingrove, Josh (27 May 2017). "Trump Goes His Own Way as G-7 Cobbles Together an Awkward Truce". Bloomberg. ^ Philip Oltermann (5 April 2017). "The many faces of Angela Merkel: 26 years of photographing the German chancellor". The Guardian. Retrieved 20 November 2018. ^ Max Bearak (29 March 2017). "Decades of yearly portraits show how power has transformed Angela Merkel". The Washington Post. Retrieved 20 November 2018. ^ Grossman, Samantha. "See the Best of Kate McKinnon's Hilarious Angela Merkel Impression". Time. Retrieved 23 January 2017. ^ Moran, Lee (11 December 2016). "'SNL' Version Of Angela Merkel Is Not Happy Donald Trump Is Time's 'Person Of The Year'". HuffPost. Retrieved 23 January 2017. ^ "Impressions – Angela Merkel". SNL Archives. Retrieved 23 January 2017. ^ "True total hottie Frau": Die bislang beste Merkel – Parodie kommt von der BBC, Buzzer, 21 January 2016. ^ Smagge, Patricia (2016). "Angela Merkel: The Unexpected – Angela Merkel – Die Unerwartete (2016) (In Dutch)". cinemagazine.nl. Retrieved 20 September 2017. ^ "Anna Katarina - IMDb". IMDB. Retrieved 14 February 2019. Nikolaus Blome: Angela Merkel – Die Zauderkünstlerin. Pantheon, München 2013, ISBN 978-3570552018. Günther Lachmann, Ralf Georg Reuth: Das erste Leben der Angela M. Piper, München 2013, ISBN 978-3492055819. "Angela Merkel collected news and commentary". The New York Times. Packer, George (1 December 2014). "The Quiet German". The New Yorker: 46–63. Bold: Chancellor; A: Served as Minister of Health 2009–2011 and then served as Minister of Economics and Technology and Vice-Chancellor (2011–present); B: Served from 2009; C: Served from 2011; D: Served from 2012; E: Served until 2013 V: Vice-Chancellor.